Mike Trout is 22 years old, and just the other day, the Los Angeles Angels centerfielder signed the highest non-arbitration one-year deal in the history of Major League Baseball for an even one million. Reports earlier in the week suggested the Angels were going to offer Trout something in the range of a six-year, $150 million contract. Now it’s likely the team will offer Trout that same six-year deal, or something similar, prior to the 2015 season, with Trout officially becoming a free agent at the age of 26 (in the event he isn’t signed to a max contract before then). I think he’s getting short-changed. If the offer matches the rumors, a free-agent Trout should most certainly walk for a better deal from a team willing to spend the cash. I’m no oracle, and it’s hard to rule out injury, deterioration, or a downward trend in performance, but with his skills, Trout can point to the salaries of his teammates when the time comes to negotiate. Two years ago, the Angels signed former St. Louis Cardinals great Albert Pujols to a 10-year, $240 million contract. So far, the investment hasn’t paid off. 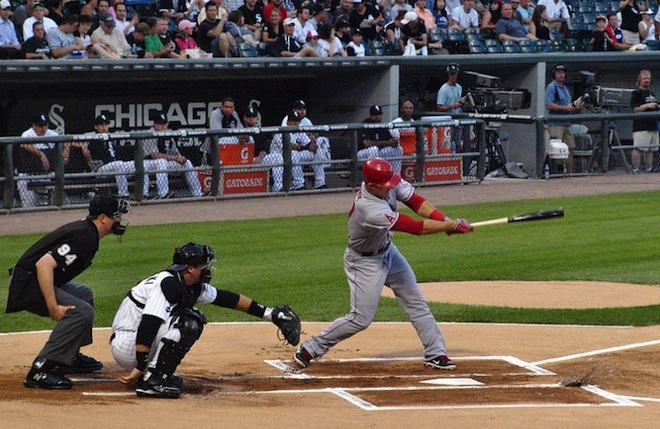 Pujols hit career lows in batting average, home runs, and RBIs last season, only playing 99 games due to a foot injury. Also, he isn’t getting any younger—he just turned 34 in January. Happy payday to you, Albert! Landis is absolutely right. Though Trout’s one-year deal is “historic,” it proves that the Angels are hesitant to pay up. And by continuing to flash his bat and glove this season, Trout is showing them how sorry they will be if they don’t reconsider—especially when Trout is wearing, oh I don’t know, pinstripes in 2018.